Bulk SMS is one of the best tools for gaining – and especially keeping – customers. Potential customers can be reached directly with bulk SMS, and contrary to e-mails, sales letters, posters and TV spots, SMS get special attention – or don’t you usually read your SMS? SMS campaigns never go unnoticed, and they offer the possibility for a direct interaction with customers. That way, the usual monologue of advertisements becomes a more effective dialogue that helps to significantly increase your turnover, for with us, you can receive responses to your bulk SMS! Regardles if you already made some experiences with SMS marketing, or are a newcomer, we are the right partner for dispatching bulk SMS. We offer a very reliable and concurrently economic service. That way, as a “White Label” service contractor, we meet the demands for successful customer communication for numerous well-known clients who send high volumes of SMS on a daily basis. Our system automatically processes text files and Excel (CSV) files. You can easily create a CSV file with your numbers and probably additional data with Excel. Simply save your Excel spreadsheet with the recipient’s numbers as CSV file. We will gladly explain you how to do it! Of course, we will gladly help you import your numbers, free of charge, in case you only have them in any other form. Contact us and we will handle the import for you. Do you have more data besides the number of your clients, e.g. his name? You can let those data be inserted into the text automatically, without any additional effort. With this personalized and individual bulk SMS you will get a lot more attention and give your clients the feeling to be personally addressed by you. Add individual places, customer numbers, appointments or else to the text. Regardless the data, our system can add it at the designated spot in the text, fitting to the recipient. Not only can you dispatch SMS with us, but your customers can also respond to them. You may either receive the responses via e-mail, or simply check them in your inbox on our web interface. That way, clients can directly answer to your bulk SMS, e. g. to confirm appointments, place orders, or request a callback. Get in communication with your customer and exploit your customer’s tiny level of inhibition to send a response SMS. Dispatching a bulk SMS with your LOX24 account is very simple. After logging in, you will find the two entries “Groups” and “New SMS”. 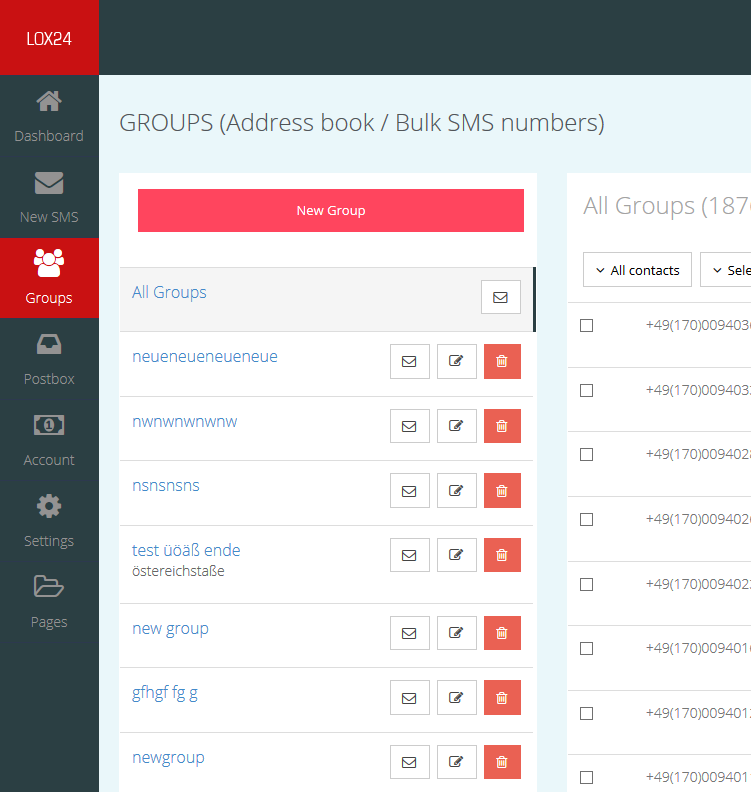 With “Groups” you can import your existing numbers and addresses, and organize them in different mailing lists. You can change, delete or add individual numbers and keep your data up-to-date that way. With “New SMS” you can send your SMS to one or more of these mailing lists, or directly import a file with numbers as well. Now enter your text and your bulk SMS can be dispatched. You can also personalize the text with additional data of your customers, e.g. their names.